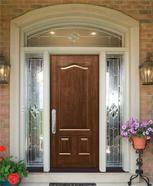 I offer outstanding service as one of the most experienced residential door installation contractors in Northern Virginia. I have personally installed over 30,000 doors! You work directly with me every step of the way. And since I am the owner your 100% satisfaction is my goal. I treat you with respect and courtesy. I show up on time! I offer products and manufacturers that I trust to have quality products all at competitive pricing. 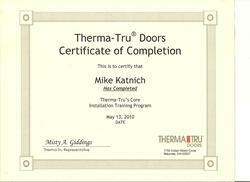 I do replacement Exterior and Interior Doors. Plus I work where I live with my family. So I am not just a contractor but your neighbor. And I do the job right because I put my name on it. 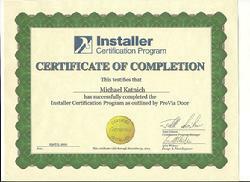 - Michael J. Katnich, Owner MJ Katnich & Co.
My goal is to assist you to select the door that best suits your needs and your budget to be professionally installed in a timely manner. "Who is going to do the actual work?" "Who is going to install my door?" They are relieved when I tell them "I am". It may be unusual for a business owner to do this much of his own work. But that is what I offer. My Expertise every step of the way. I personally inspect and measure, help you understand your door options, then provide an accurate and total price, deliver and install your new doors and haul away the old door and debris. And I will do the job right because I put my name on it. I offer you for your Residenital Door needs. If your home's front entryway gives a lackluster impression, upgrading to a beautiful and energy saving door can be both affordable and worry-free. DoorsVA.com is packed with all of the information and resources you need to get started in your search for the perfect residential exterior doors for your home. Our extensive selection features all of the leading brands including ProVia, Therma-Tru, Masonite, Jeld-Wen, Simpson and Andersen doors, and our links allow you to browse these styles from the comfort of your own home. We encourage you to call to schedule a free inspection and estimate. Michael Katnich will bring 36 years of experience directly to your Northern Virginia home where he will precisely measure your selected doorways and present you with a wide array of ideal options. You'll get to choose from among wood, steel, glass and fiberglass entry doors in every conceivable style. We are prepared to deliver and install both interior and exterior doors in a timely manner of time and for a competitive price. Remember, there's no charge or obligation when you call for a customized estimate. And never a high pressure sales close. Please continue exploring DoorsVA.com by reading a few of our helpful articles, and call 703-430-7850 to make your appointment today. 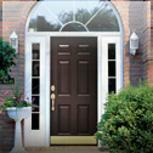 With the milder temperatures, it is a perfect time to replace your door. Call 703-430-7850 for an estimate today.